$10 (download version) buy now! $10 (+S&H, DVD version) buy now! The Windows 8 Superguide is endorsed by The Federation of SeniorNet Societies New Zealand for use in its 90 learning centres across New Zealand. We are proud to support SeniorNet New Zealand with our best selling Windows 8 Superguide DVD and delighted to show their endorsement of it. To order the Windows 8 Superguide on DVD, for $10 plus shipping, click here. That’s MUCH cheaper than most sites sell basic e-books for! We are confident you won’t find an easier, quicker way to learn Windows 8 on the internet at any price. We ship to most destinations worldwide! 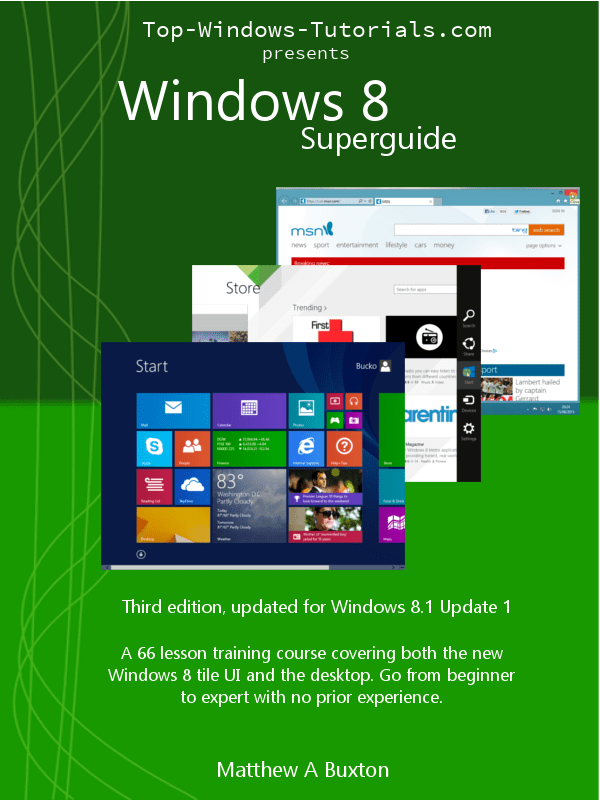 Or buy the Windows 8 Superguide as a digital download! Use the button below to buy the Windows 8 Superguide digital download through Clickbank. Your payment details will be secured using Clickbank’s SSL encrypted server. Remember that with this service you will receive a download link only, you will not receive a physical product. Note that your credit card will show a transaction from Clickbank, not Top-Windows-Tutorials. Remember you can also supplement your learning with a copy of the Windows 8 Superguide eBook for your kindle or a physical textbook.